Presidential Spokesperson Ernesto Abella said in a press briefing that no one has been chosen yet to replace Sueno. No reference was made to Bongbong Marcos, son of the late President Ferdinand Marcos after the president let go of DILG Secretary Ismael Sueno. Sueno remains to accept whatever the President decides upon. President Rodrigo Duterte dismissed Department of Interior and Local Government (DILG) Secretary Ismael Sueno after the investigation on corruption allegations against him. Abella confirms in a statement that the President removed Sueno after the Cabinet meeting last Monday due to loss of trust and confidence. Since the President is very serious to restore trust in the government he will not countenance even a slight hint of corruption. Sueno’s dismissal comes after the MRRD-NECC accused Sueno of allegedly abusing his power as the DILG head through a confidential letter. Marcos was one of the names that Duterte lined up to become Interior Secretary. The President has close ties to the Marcoses. 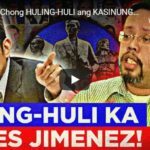 So close that he is seen to fulfill his campaign promise of burying former President Marcos at the Libingan ng mga Bayani last November 2016. 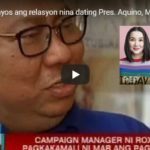 He also mentioned publicly that if he cannot solve the country’s crimes in six months, he will give the presidency to Marcos who was winning at that time in surveys. Bongbong Marcos as many of his supporters reiterated that he is not a mere replacement of any post. He is allegedly the real winner of the 2016 VP race. The electoral protest against Leni Robredo is still ongoing and he cannot abandon that by taking up an elective post. 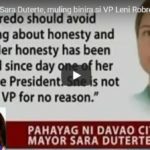 Some are even not happy with the impeachment plans against Robredo because it will not make him the second highest leader of the country. 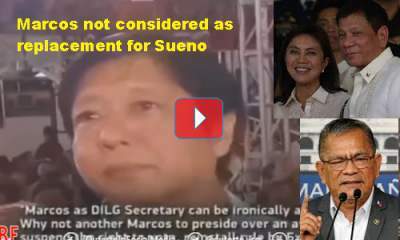 Marcos must assume the VP post as a stepping stone for the presidency as aspired by the Binay camp and his avid loyalists.